Also - who buys ready-made boiled eggs?! 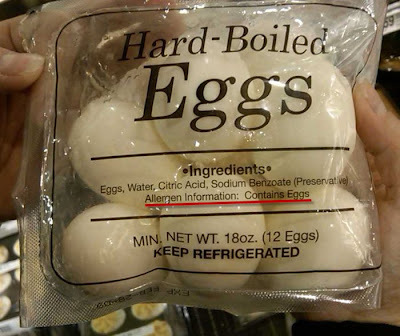 Interesting to see that hard boiled eggs actually contain eggs...who would have thought!!! I think more funny than the eggs is the above comment from anonymous who signs the comment with their name!!! people doing 2 performances a day of Cool Hand Luke!! Haha. BTW did you know that KP peanuts might contain nuts ?